The farmers market you know and love is back for our first of three special fall markets this Sunday, November 6th from 10 AM to 3 PM. 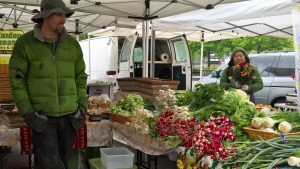 The market will take place in its usual location, in the parking lot adjacent to Lake Forest Park City Hall at the corner of Bothell Way NE and Ballinger Way NE. As always, the market will offer a delicious selection of fresh produce including all the best in fall veggies from many of your favorite farms like Garden Treasures, Well Fed Farm, RP Guerrero, and Alvarez Organics. Hidden River will be taking orders for Thanksgiving turkeys (while supplies last) while Middle Fork Roasters, Lupine Vineyard, and Lopez Vineyard will ensure that you’ve g ot the tastiest beverages on-hand to put the perfect finishing touches on your holiday meals. You’ll also have plenty of tasty snacks to enjoy with Vespucci Pizza and Drummin’ Up Wontons serving up hot foods to keep out the chill. Plus you can stock up on sweet treats for the family from market favorites like Blue Cottage Jams, Classic Kettle Corn, Pete’s Perfect Toffee, and The Beekeepers Secret. All of this plus Wilson Fish and a special visit from the Heart of Dreams Alpacas! Sunday, November 20th, head to the market to shop for your seasonal produce, pick-up those Thanksgiving turkeys, and all your other Thanksgiving necessities. And come by the crafts fair to get a jump on your holiday shopping before the madness of Black Friday. Finally, on Sunday, December 18th don’t miss the final Farmers Market/Holiday Crafts Fair combo event to shop for all your last-minute gifts, stocking stuffers, and holiday dinner essentials. The November 20th and December 18th farmers markets will take place in their usual outdoor location (in front of the Professional Building at Lake Forest Park Town Center) if the weather permits. In case of inclement weather, they’ll move inside to Third Place Commons on the upper level of Town Center. Both Holiday Crafts Fairs will take place from 10-3 in the lower lobby of Town Center. See you there! The LFP Farmers Market and Holiday Craft Fairs are presented by Third Place Commons, a community-supported 501(c)3 nonprofit organization dedicated to fostering real community in real space. Previous Post: Halloween Candy, Comedy, Magic, Music, and More!